» On I-5: What’s my lane? On I-5: What’s my lane? There is no shortage of lines marking the lanes in this spot on Interstate 5. The trick is to know which ones count. If it looks a little confusing at first glance, it really isn’t. And it also gives the lie, at least in Oregon, to the freely bandied-about allegation that we’re not keeping our roads and bridges in good repair. Interstate 5 in Oregon is one place where construction and upkeep never stop. The result is an almost perfectly paved highway between Southern Oregon and the mid-Willamette Valley. The multiple lanes shown here are northbound near mile post 166, about 10 miles south of Cottage Grove. Working under an $18.5 million contract, crews are busy repairing or replacing much of the concrete road surface between exits 162 and 170. ODOT says that after Labor Day, the project will enter a new phase requiring more lane and ramp closures: “Starting the week of Sept. 2-5, I-5 will be limited to one lane of traffic in both directions for 10 weeks. Both northbound lanes will be closed and I-5 traffic will be shifted onto a temporary alignment.” Needless to say, but ODOT says it ayway: “Motorists should expect congestion and delays during peak travel times.” The work is expected to take till the end of the year. 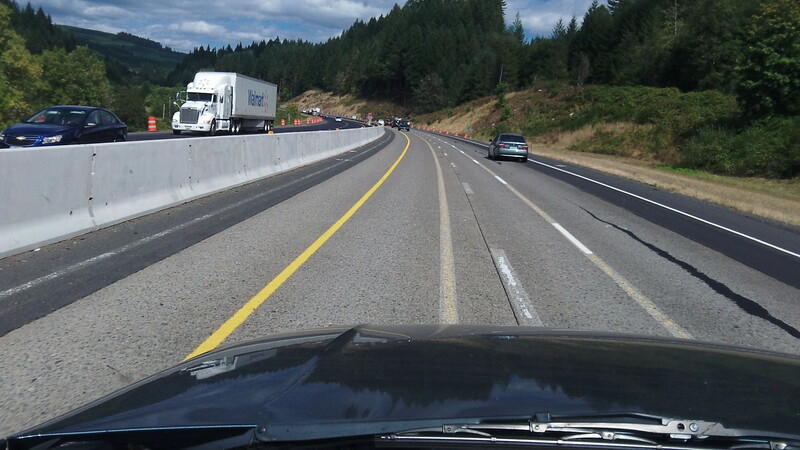 South of this spot, work has been going on to replace or repair guardrails in several places along 145 miles of I-5 in Jackson, Jospehine and Douglas counties.